the Cone sisters (pictured) were friends of Gertrude Stein and amassed a collection of artwork of Picasso, Renoir, Gauguin and van Gogh — now worth one billion US dollars? Gertrude Stein (February 3, 1874 – July 27, 1946) was an American writer who spent most of her life in France, and who became a catalyst in the development of modern art and literature. Her life was marked by two primary relationships, the first with her brother Leo Stein, from 1874-1914 (Gertrude and Leo), and the second with her partner Alice B. Toklas, from 1907 until Stein's death in 1946 (Gertrude and Alice). Stein shared her salon at 27 rue de Fleurus, Paris, first with Leo and then with Alice. Throughout her lifetime, Stein also cultivated significant relationships with well-known members of the avant garde artistic and literary world. Stein was gregarious and had a wealth of friends and modern paintings that attracted many to her Paris salon. Her personality also allowed her to transform her social outlets, by focusing on new friendships, members of the youthful generation of the time. For example, Stein was friends with "up and coming" artists Matisse and Picasso in the early 1900s, writers Thornton Wilder and Ernest Hemingway in the 20s, and with the American GI's in the 40s. Each period marked Stein's connections with young, and artistic people at the center of contemporary developments and events. Her writing reflects, or in the case of The Autobiography, reflects on each decade. Gertrude Stein, the youngest of a family of five children, was born in 1874 in Allegheny, Pennsylvania (merged with Pittsburgh in 1907), to well-educated German-Jewish immigrant parents. (Stein family portrait) (image of Gertrude at between two and three years old) (four years old) Her father, Daniel Stein, was an executive with a railroad, whose prudent investments in streetcar lines and real estate had made the family wealthy. When Gertrude was three years old, the Steins moved for business reasons first to Vienna (Stein children in Vienna, with governess and tutor) and then to Paris. Her family returned to America in 1878, settling in Oakland, California, where she attended First Hebrew Congregation of Oakland's Sabbath school.. In 1888, Amelia Stein (Gertrude's mother) died, and in 1891 Daniel Stein (Gertrude's father) died. Michael Stein (her eldest brother) took over the family business holdings, and made wise business decisions and arranged the affairs of his siblings. Michael arranged for Gertrude, and her sister Bertha, to live with their mother's family in Baltimore after the deaths of their parents. (Mellow, 1974, pp. 25-28). In 1892 she lived with her uncle David Bachrach. It was in Baltimore that Gertrude met Claribel Cone and Etta Cone who held Saturday evening salons which Gertrude would later emulate in Paris, who shared an appreciation for art and conversation about it, and who modeled a domestic division of labor that Gertrude was later to replicate in her relationship with Alice B. Toklas. (Ibid. pp. 41-42). Leo Stein's acquaintances and study of modern art provided the seed for the famous Stein art collections. He began with Bernard Berenson, who hosted Gertrude and Leo in his English country house in 1902, and who suggested Paul Cézanne and Ambroise Vollard's art gallery. The joint collection of Gertrude and Leo Stein began in late 1904, when Michael Stein announced that their trust account had accumulated a balance of 8,000 francs. They spent this windfall at Vollard's Gallery, buying Gauguin's Sunflowers and Three Tahitians, Cézanne's Bathers, and two Renoirs. The art collection grew and the walls at 27 Rue de Fleurus were continuously rearranged to make way for new acquisitions. In "the first half of 1905" the Steins acquired Cézanne's Portrait of Mme Cézanne and Delacroix's Perseus and Andromeda. Shortly after the opening of the Paris Autumn Salon of 1905 (on October 18, 1905), the Steins acquired Matisse's Woman with the Hat and Picasso's Young Girl with Basket of Flowers (lower left). By early 1906, Leo and Gertrude Stein's studio was filled with paintings by Henri Manguin, Pierre Bonnard, Pablo Picasso, Paul Cézanne, Pierre-Auguste Renoir, Honoré Daumier, Henri Matisse, and Henri de Toulouse-Lautrec. Their collection was reflective of two famous art exhibitions that took place during their residence together in Paris, and to which they contributed, either by lending their art, or by patronizing the featured artists. Collecting was a shared interest in Gertrude and Leo's inner circle; their elder brother, Michael, and sister-in-law Sarah (Sally) acquired a large number of Henri Matisse paintings; Gertrude's friends from Baltimore, Claribel and Etta Cone, collected in a similar vein, eventually donating their art collection, virtually intact, to the Baltimore Museum of Art. While numerous artists circulated into the Stein salon, many of these artists were not represented among the paintings on the wall at 27 Rue de Fleurus. Where Renoir, Cézanne, Matisse, and Picasso's works dominated Leo and Gertrude's collection, Sarah Stein's collection focused on Matisse. Among the Picasso circle who frequented the Saturday evenings were: Fernande Olivier (Picasso's mistress), Georges Braque (artist), André Derain (artist), Max Jacob (poet), Guillaume Apollinaire (poet), Marie Laurencin (Apollinaire's mistress and an artist in her own right), Henri Rousseau (painter). After Gertrude's and Leo's households separated in 1914, she continued to collect examples of Picasso's art which had turned to Cubism (Gertrude several years later). At her death, Gertrude's remaining collection focused on the artwork of Picasso and Juan Gris, having sold most of her other pictures. Pablo Picasso, Portrait of Gertrude Stein, 1906, Metropolitan Museum of Art, New York City. When someone commented that Stein didn't look like her portrait, Picasso replied, "She will". In 1903, Gertrude Stein moved to Paris during the height of artistic creativity gathering in Montparnasse. From 1903 to 1914 she lived in Paris with her brother Leo, an art critic. During this period, Gertrude determined that she was a writer. Her earliest writings focused on retellings of her college experiences. A turning point, was in her critically acclaimed "Three Lives." “ all the forces that have been engaged through the years of childhood, adolescence and youth in confused and ferocious combat range themselves in ordered ranks (and during which) the straight and narrow gateway of maturity, and life which was all uproar and confusion narrows down to form and purpose, and we exchange a great dim possibility for a small hard reality. She began Three Lives in the spring of 1905, and she finished it the following year. (Mellow, 1974, p. 77). Gertrude Stein fixed the date for her writing of The Making of Americans from 1906-1908. Her biographer has uncovered evidence that it began in 1902 and did not end until 1911. (Mellow, 1974, p. 114-22). Stein compared her work to James Joyce's Ulysses and to Marcel Proust's In Search of Lost Time. Her critics were less enthusiastic about its place in the canon of great literature. (Ibid., p. 122). 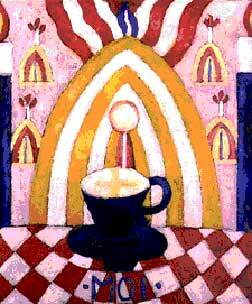 Gertrude's word portraits apparently began with her portrait of Alice B. Toklas, "a little prose vignette, a kind of happy inspiration that had detached itself from the torrential prose of The Making of Americans". (Mellow, 1974, p. 129). Gertrude's early efforts at word portraits are catalogued in Mellow, 1974, p. 129-37 and under individual's names in Kellner, 1988. Matisse and Picasso were subjects of early portraits (Mellow, 1974, 154-55, 157-58), later collected and published in Geography and Plays (published 1922) and Portraits and Prayers (published 1934). (Kellner, 1988, pp. 34-35 and 56-57). The Matisse and Picasso portraits were reprinted in MoMA, 1970, pp. 99-102. Her subjects included many ultimately famous personages, and her subjects provided an inside view of what she observed in her Saturday salons at 27 Rue de Fleurus: "Ada" (Alice B. Toklas), "Two Women" (The Cone Sisters) (Claribel Cone and Etta Cone), Miss Furr and Miss Skeene (Ethel Mars and Maud Hunt Squire), "Men" (Hutchins Hapgood, Peter David Edstrom, Maurice Sterne), "Matisse" (1909) (Henri Matisse), "Picasso" (1909) (Pablo Picasso), "Portrait of Mabel Dodge at the Villa Curonia" (1911) (Mabel Dodge Luhan), and "Guillaume Apollinaire" (1913). Claire Marie Press ... is absolutely third rate, & in bad odor here, being called for the most part 'decadent" and Broadwayish and that sort of thing. . . . I think it would be a pity to publish with [Claire Marie Press] if it will emphasize the idea in the opinion of the public, that there is something degenerate & effete & decadent about the whole of the cubist movement which they all connect you with, because, hang it all, as long as they don't understand a thing they think all sorts of things. My feeling in this is quite strong. (Ibid.) Gertrude ignored Mabel's exhortations, and eventually Mabel, and published 1,000 copies of the book, in 1914. (An antiquarian copy was valued at over $1,200 in 2007). It is currently in print. Stein's poems in Tender Buttons are highly stylised and hermetic, as she made preference for sound over sense. Shortly thereafter, Gertrude introduced Alice to Pablo Picasso at his studio, where he was at work on Les Demoiselles d'Avignon. Les Demoiselles d'Avignon was a painting that "marked the beginning of the end of Leo's support for Picasso." In 1908, they summered in Fiesole, Italy, Alice staying with Harriet Lane Levy, her companion on her trip from the United States, and her housemate until Alice moved in with Gertrude and Leo in 1910. That summer, Gertrude stayed with Michael & Sarah Stein, their son Allan, and Leo in a nearby villa. (Ibid.) Gertrude and Alice's summer of 1908 is memorialized in images of the two of them  in Venice, at the piazza in front of Saint Mark's. In the early summer of 1914, Gertrude bought three paintings by Juan Gris: Roses (Beinecke photograph), Glass and Bottle, and Book and Glasses. Shortly after she purchased them from Daniel-Henry Kahnweiler's gallery (Mellow, 1974, at 209), the war broke out, Kahnweiler's stock was confiscated and he was not allowed to return to Paris. Gris, who before the war had entered a binding contract with Kahnweiler for his output, was left without income. Gertrude attempted to enter an ancillary arrangement in which she would forward Gris living expenses in exchange for future pictures. Gertrude and Alice had plans to visit England to sign a contract for the publication of Three Lives, to spend a few weeks, and journey on to Spain. They left Paris on July 6, 1914 and returned on October 17. [Ibid., 210-15]. When Britain declared war on Germany in World War I, Stein and Toklas were visiting Alfred North Whitehead in England. After a three-week trip to England that stretched into three months with the onset of the War, they returned to France, where they spent the first winter of the war. With money acquired from the sale of Gertrude's last Matisse Woman with a Hat to her brother Michael, Gertrude and Alice vacationed in Spain from May 1915, through the spring of 1916. During their interlude in Majorca, Spain, Gertrude continued her correspondence with Mildred Aldrich who kept her apprised of the War's progression, and eventually inspired Gertrude and Alice to return to France to join the war effort. Alice and Gertrude returned to Paris in June 1916 and acquired a Ford with the help of connections in the United States; Gertrude learned to drive it with the help of her friend William Edwards Cook. (Ibid., at 226-27). Gertrude and Alice then volunteered to drive supplies to French hospitals, in the Ford they named Auntie, "after Gertrude's aunt Pauline, 'who always behaved admirably in emergencies and behaved fairly well most times if she was flattered.'" (Ibid., at 228) (image of Auntie with Gertrude and Alice). In the 1920s, her salon at 27 Rue de Fleurus, with walls covered by avant-garde paintings, attracted many of the great writers of the time, including Ernest Hemingway, Ezra Pound, Thornton Wilder, and Sherwood Anderson. While she has been credited with coining the term "Lost Generation" for some of these expatriate American writers, at least three versions of the story that led to the phrase are on record, two by Ernest Hemingway and one by Gertrude Stein (Mellow, 1974, pp. 273-74). During the 20s, she became friends with writer Mina Loy, and the two would remain lifelong friends. Extremely charming, eloquent, and cheerful, she had a large circle of friends and tirelessly promoted herself. Her judgments in literature and art were highly influential. She was Ernest Hemingway's mentor, and upon the birth of his son he asked her to be the godmother of his child. In the summer of 1931, Stein advised the young composer and writer Paul Bowles to go to Tangier, where she and Alice had vacationed. In the 1930s, Gertrude and Alice became famous with the 1933 mass market publication of The Autobiography of Alice B. Toklas. She and Alice took an extended lecture tour in the United States during this decade. They also spent many summers in Bilignin, France, and doted on a famous poodle named "Basket" whose successor, "Basket II", comforted Alice in the years after Gertrude's death. Prior to World War II she made public her opinion that Adolf Hitler should be awarded the Nobel Peace Prize. "I say that Hitler ought to have the peace prize, because he is removing all the elements of contest and of struggle from Germany. By driving out the Jews and the democratic and Left element, he is driving out everything that conduces to activity. That means peace ... By suppressing Jews ... he was ending struggle in Germany" (New York Times Magazine, May 6, 1934). Stein was later to comment on Hitler, Mussolini, and Roosevelt: "There is too much fathering going on just now and there is no doubt about it fathers are depressing" (Blackmer 1995). With the outbreak of World War II, Stein and Toklas moved to a country home that they had rented for many years previously in Bilignin, Ain, in the Rhône-Alpes region. Referred to only as "Americans" by their neighbors, Gertrude and Alice, who were both Jewish, escaped persecution probably because of their friendship to Bernard Faÿ who was a collaborator with the Vichy regime and had connections to the Gestapo. When Faÿ was sentenced to hard labor for life after the war, Gertrude and Alice campaigned for his release. Several years later, Alice would contribute money to Faÿ's escape from prison. After the war, Gertrude's status in Paris grew when she was visited by many young American soldiers. The preface of the exhibition for Riba-Rovira in Paris, written in 1945, "is one of Gertrude Stein's last texts" on its vision of the painting art, approximately one year before its death. She expresses her sights on Picasso, Cezanne, Riba-Rovira, Matisse, Juan Gris just before her death. So we have her last view on "the Painting School of Paris" through Francisco Riba-Rovira, a familiar artist of her "artists salon" at "rue de Fleurus" and she also possessed pictures among which one at least would have appeared on the wall of its lounge. . It is inevitable that when we really need someone we find him. The person you need attracts you like a magnet. I returned to Paris, after these long years spent in the countryside and I needed a young painter, a young painter who would awaken me. Paris was magnificent, but where was the young painter?I looked everywhere:at my contemporaries and their followers. I walked a lot, I looked everywhere, in all the galleries , but the young painter was not there. Yes, I walk a lot, a lot at the edge of the Seine where we fish, where we paint, where we walk dogs ( I am of those who walk their dogs).Not a single young painter! One day, on the corner of a street, in one of these small streets in my district, I saw a man painting .I looked at him; at him and at his painting, as I always look at everybody who creates something _I have an indefatigable curiosity to look_ and I was moved .Yes, a young painter! We began to speak, because we speak easily, as easily as in country roads, in the small streets of the district . His story was the sad story of the young people of our time .A young Spaniard who studied in fine arts in Barcelona: civil war; exile; a concentration camp;escape .Gestapo, another prison, another escape... Eight lost years! If they were lost, who knows? And now a little misery, but all the same the painting. Why did I find that it was him the young painter, why? I visited his drawings, his painting :we speak . I explained that for me, all modern painting is based on what Cézanne nearly made, instead of basing itself on what he almost managed to make. When he could not make a thing, he hijacked it and left it .He insisted on showing his incapacity:he spread his lack of success :showing what he could not do, became an obsession for him .People influenced by him were also obsessed by the things which they could not reach and they began the system of camouflage.It was natural to do so, even inevitable:that soon became an art, in peace and in war, and Matisse concealed and insisted at the same time on that Cézanne could not realize, and Picasso concealed, played and tormented all these things. 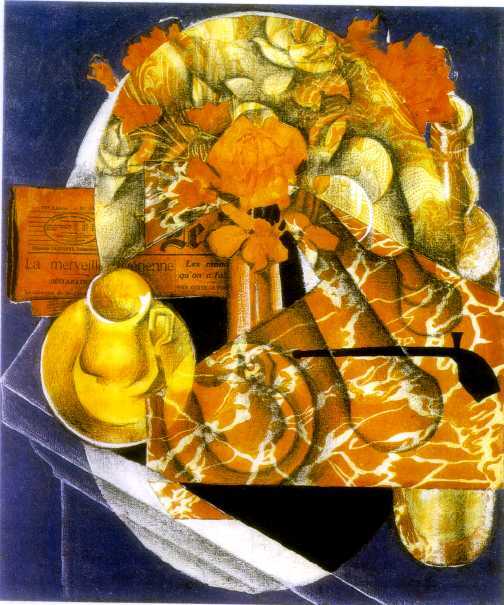 The only one who wanted to insist on this problem, was Juan Gris. He persisted by deepening the things which Cézanne wanted to do, but it was too hard a task for him :it killed him. And now here we are, I find a young painter who does not follow the tendency to play with what Cézanne could not do, but who attacks any right the things which he tried to make ,to create the objects which have to exist ,for ,and in themselves ,and not in relation . This young painter has his weakness and his strength .His force will push him in this road .I am fascinated and that is why he is the young painter whose I needed. It is François(Francisco)Riba-Rovira. Stein died at the age of 72 from stomach cancer in Neuilly-sur-Seine on July 27, 1946, and was interred in Paris in the Père Lachaise cemetery. In one account by Toklas, when Stein was being wheeled into the operating room for surgery on her stomach, she asked Toklas, "What is the answer?" When Toklas did not answer, Stein said, "In that case, what is the question?" Stein named writer and photographer Carl Van Vechten as her literary executor, and he helped to usher into print works of hers which remained unpublished at the time of her death. A monument to Stein stands on the Upper Terrace of Bryant Park, New York. More positive affirmations of Stein's sexuality and gender began with her relationship with Toklas. Ernest Hemingway describes how Alice was Gertrude's "wife" in that Stein rarely addressed his (Hemingway's) wife, and he treated Alice the same, leaving the two "wives" to chat. (Grahn 1989) Alice was 4'11" tall, and Gertrude was 5'1". Politically, Stein unambiguously leaned to the right, though the extent of her right-wing views is debated. According to Janet Malcolm's Two Lives: Gertrude and Alice, Stein was a life-long Republican and vocal critic of Franklin Delano Roosevelt and the New Deal. She openly supported Franco in the Spanish Civil War and admired Vichy leader Maréchal Pétain, translating some of the latter's speeches into English. These unpublished translations included a favorable introduction in which she compared him to George Washington. Some have argued for a more nuanced view of Stein's collaborationist activity, arguing that it was rooted in her wartime predicament and status as a Jew in Nazi-occupied France. n.d.--before 1912 est. 1912--books and paintings 1913--est. 1913 1913--est. 1913 1913--est. 1913 1913--est. 1913 1913--est. 1913 (Young Girl with Basket of Flowers fades, as pictures at right come into focus 1914--undated, but likely after 1914 1920--behind writer 1922--flanking fireplace n.d.--1922 est. 1906--Pablo Picasso, painting; 1907--Felix Vallotton, painting; 1912--Michael Brenner, sculpture; 1913--Alvin Langdon Coburn, photograph; photograph; 1916--Marsden Hartley, painting, One Portrait of One Woman; 1920--Jacques Lipchitz, sculpture; 1923--Man Ray, photograph (with Alice B. Toklas); photograph (with Joe Davidson); 1923--Jo Davidson, sculpture, photo of Jo Davidson sculpture by Dewitt Ward; 1927--Man Ray, photograph; 1928--Christian Berard, drawing, drawing; 1929--Eugene Berman, Portrait of Gertrude Stein at Bilignin, pen and ink (Mellow, 1974, image insert pp. 340-41); 1930--Pavel Tchelitchew, brush and black ink drawing; 1930's? (n.d.)--Antoinette Champetier De Ribes, sculpture; 1931--George Platt Lynes, photograph; photograph; 1933--Francis Picabia, painting; photograph of painting (Beinecke Library); 1934/1963--Carl Van Vechten 1963 photograph, of a 1963 painting by Richard Banks (artist), of a 1934 photograph by Carl Van Vechten; 1934--Samuel Johnson Woolf, drawing for October 27, 1934 Newsweek; 1935--Pierre Tal-Coat, two known paintings, not on internet; 1935--Imogen Cunningham, photograph; 1938--Cecil Beaton, photograph; photograph; 1945--Francesco Riba-Rovira, painting (referenced in Kellner, 1988, p. 242); 1975--Red Grooms, multi-media; 1980--Andy Warhol, painting; 1991--Faith Ringgold, quilt / large version of Ringgold quilt from Art In Context. Welcome to 27 Rue de Fleurus; with Godiva and Alice B. Toklas; passport photos; passport photos; with Alice; with Alice; with Alice and Basket at Bilignin; with Alice (studio portrait); Moving Forward; War's End; MoMA Installation of Picasso Portrait. Hobhouse, 1975; Kellner, 1988; Mellow, 1974; Stendhal, 1994 (image dating and source authors). Stein's writing appears on three different planes: her hermetic works that have gone largely unread, as best illustrated by Stein's The Making of Americans: The Hersland Family; her popularized writing in The Autobiography of Alice B. Toklas which made her famous; and her speech writing and more accessible autobiographical writing of later years, of which Brewsie and Willie is a good example. After moving to Paris in 1903, she started to write in earnest: novels, plays, stories, libretti and poems. Increasingly, she developed her own highly idiosyncratic, playful, sometimes repetitive and sometimes humorous style. Typical quotes are: "Rose is a rose is a rose is a rose"; "Out of kindness comes redness and out of rudeness comes rapid same question, out of an eye comes research, out of selection comes painful cattle"; about Oakland, "There is no there there"; and "The change of color is likely and a difference a very little difference is prepared. Sugar is not a vegetable." These stream-of-consciousness experiments, rhythmical word-paintings or "portraits", were designed to evoke "the excitingness of pure being" and can be seen as an answer to Cubism, plasticity and/or collage, in literature. Many of the experimental works such as Tender Buttons have since been interpreted by critics as a feminist reworking of patriarchal language. These works were loved by the avant-garde, but mainstream success initially remained elusive. Despite Stein's work on automatic writing with William James it is clear Stein did not see her own work as automatic, more as a 'excess of consciousness'. Though Gertrude collected cubist paintings (primarily by Picasso until she could no longer afford them), the biggest visual or painterly influence on Stein's work is that of Cézanne, specifically in her idea of equality, what Judy Grahn calls commonality, distinguishing from universality or equality: "the whole field of the canvas is important" (p. 8). Rather than a figure/ground relationship, "Stein in her work with words used the entire text as a field in which every element mattered as much as any other." It is a subjective relationship that includes more than one viewpoint, to quote Stein: "The important thing is that you must have deep down as the deepest thing in you a sense of equality." Gertrude Stein wrote in longhand, typically about half an hour per day. Alice B. Toklas would collect the pages, type them up and deal with the publishing and was generally supportive while Leo Stein publicly criticized his sister's work. Indeed, Toklas founded the publisher "Plain Editions" to distribute Stein's work. Today, most manuscripts are kept in the Beinecke Library at Yale University. In 1932, using an accessible style to accommodate the ordinary reading public, she wrote The Autobiography of Alice B. Toklas; the book would become her first best-seller. Despite the title, it was really her own autobiography. She described herself as extremely confident, one might even say arrogant, always convinced that she was a genius. She was disdainful of mundane tasks and Alice Toklas managed everyday affairs. The style of the autobiography was quite similar to that of The Alice B. Toklas Cookbook, which was actually written by Alice and contains several unusual recipes such as one for Hashish Fudge (also called Alice B. Toklas brownies), submitted by Brion Gysin. Several of Stein's writings have been set by composers, including Virgil Thomson's operas Four Saints in Three Acts and The Mother of Us All, and James Tenney's skillful if short setting of Rose is a rose is a rose is a rose as a canon dedicated to Philip Corner, beginning with "a" on an upbeat and continuing so that each repetition shuffles the words, eg. "a/rose is a rose/is a rose is/a rose is a/rose." As for Stein, I do not think her too important. I do think she had an important thing to do, not for the public, but for the artist who happens to work with words as his material. F. W. Dupee (1990, p. IX) defines "Steinese" as "gnomic, repetitive, illogical, sparsely puncutated...a scandal and a delight, lending itself equally to derisory parody and fierce denunciation. Though Stein influenced authors such as Ernest Hemingway and Richard Wright, as hinted above, her work has often been misunderstood. Composer Constant Lambert (1936) naively compares Stravinsky's choice of "the drabbest and least significant phrases" in L'Histoire du Soldat to Gertrude Stein's in "Helen Furr and Georgine Skeene" (1922), specifically: "[E]veryday they were gay there, they were regularly gay there everyday", of which he contends that the "effect would be equally appreciated by someone with no knowledge of English whatsoever", apparently entirely missing the pun frequently employed by Stein. "Everybody gets so much information all day long that they lose their common sense". "Hemingway, remarks are not literature". "I've been rich and I've been poor. It's better to be rich". "America is my country, but Paris is my hometown". "It is extraordinary that whole populations have no projects for the future, none at all. It certainly is extraordinary, but it is certainly true". "A rose is a rose is a rose is a rose". "To write is to write is to write is to write is to write is to write is to write". "Out of kindness comes redness and out of rudeness comes rapid same question, out of an eye comes research, out of selection comes painful cattle". "I really do not know that anything has ever been more exciting than diagramming sentences." "I have made it [white electric light] but have I a soul to pay for it." "Everything is so dangerous that nothing is really very frightening." "If it can be done, why do it ?" "It is natural to indulge in the illusions of hope. We are apt to shut our eyes to that siren until she allures us to our death." The Lynne Truss book, Eats, Shoots and Leaves, makes several references to Stein's writings, specifically Stein's vendetta against most punctuation. In 2005, playwright/actor Jade Esteban Estrada portrayed Stein in the solo musical ICONS: The Lesbian and Gay History of the World, Vol. 1 at Princeton University. In the 2006 motion picture The Devil Wears Prada, the character Christian Thompson, played by Simon Baker, attributes the statement "America is my country, but Paris is my hometown" to Gertrude Stein. Chuck Coleman, jazz-pop singer/songwriter, sings about Stein in the track "Me And Gertrude Stein" from his album, "People, Places, and Flings." Scottish rock band Idlewild released a single called Roseability in 2000 from the album 100 Broken Windows. This is apparently a reference to Stein's observation that "Rose is a rose is a rose is a rose". The song also contains the refrain, "Gertrude Stein says that's enough." The phrase 'a rose is a rose...' appears in the musical 'Singing in the Rain', when Gene Kelly is receiving elocution lessons to allow him to move from silent films to talkies. He sings it with Donald O'Connor. In an episode of The X-Files called "Bad Blood", the character Fox Mulder, played by David Duchovny, warns his partner, Dana Scully, played by Gillian Anderson, that if she goes to prison, "your cellmate's nickname is gonna be Large Marge, she's gonna read a lot of Gertrude Stein." In "La Vie Boheme", a song from the musical Rent, a toast is made to Gertrude Stein. The Elephant 6 band Olivia Tremor Control mentions Stein in their song "Define a Transparent Dream". In Anastasia (1997 film), Gertrude Stein is seen in a car singing "Where a rose is a rose!" during a musical number, "Paris Holds The Key to Your Heart". In The Rutles' song "Another Day", a reference to her is made: "A glass of wine with Gertrude Stein,/I know I'll never share,/but I don't mind. That's just the kind/of cross each man must bear./I'm on my way,/I cannot stay another day." In the Marvel comic Runaways (comic),one character is named Gertrude Yorkes while her boyfriend's name is Chase Stein. Loving Repeating is a musical by Stephen Flaherty based on the writings of Gertrude Stein and is unified through a 1934 speech that Stein delivered at the University of Chicago. Stein and Alice B. Toklas are both characters in the eight person show. In the Swedish film "The Adventures of Picasso" ("Picassos Äventyr") Bernard Cribbins plays a hilarious Gertrude Stein, who among other things dresses up as a pirate in a masquerade held by Henry Rousseau, almost cutting the head of Picasso with her sword, by accident. Wilfrid Brambell plays Alice B Toklas. In Mame, a stage and film musical, the character Vera Charles declares in the song lyrics of "Bosom Buddies", "... but sweetie, I'll always be Alice Toklas if you'll be Gertrude Stein." In the movie "Corrina, Corrina", Whoopi Goldberg quotes Gertrude Stein with "There is no there there", though she (Goldberg) is referring to a romantic relationship while Stein was describing the search for her childhood home in Oakland, California. The artist Poe, wrote the song "A Rose is A Rose" for the album Lounge-a-palooza, and makes several references to Gertrude Stein and lesbian sexuality. The band Le Tigre reference Gertrude Stein in their song "Hot Topic" from their 1999 self-titled album. The band The Butchies include a song named Gertrude + Stein on their album Population 1975. 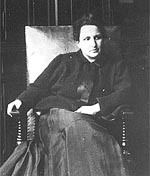 The Wilde Stein Alliance for Sexual Diversity, one of the first LGBT student organizations in the United States, is named in part after Gertrude Stein. The cartoon series "Animaniacs" references Gertrude Stein in the episode entitled "Baloney & Kids." The Warners are forced to make faces on paper plates, Dot Warner choosing to make a charicature of Gertrude Stein. The film I Love You, Alice B. Toklas is a 1968 comedy film starring Peter Sellers. It featured a song of the same title by Harpers Bizarre. Blackmer, Corrine E. "Gertrude Stein" in Summers, Claude J. (1995). The Gay and Lesbian Literary Heritage. ISBN 0805050094. Bowers, Jane Palatini. 1991. "They Watch Me as They Watch This":Gertrude Stein's Metadrama. Philadelphia: University of Pennstlvania Press. ISBN 0812230574. Dean, Gabrielle. "Grid Games: Gertrude Stein's Diagrams and Detectives" in Modernism/modernity 15:2  April 2008), 317-41. Hobhouse, Janet. Everybody Who Was Anybody: A Biography of Gertrude Stein New York: G. P. Putnam's Sons, 1975. ISBN 9781199832993. Kellner, Bruce, ed. A Gertrude Stein Companion: Content with the Example. New York, Westport, Connecticut, London: Greenwood Press, 1988. ISBN 0313250782. ---. Strangers in Paradise, The New Yorker, November 13, 2006, p. 54-61. Perelman, Bob. The Trouble with Genius: Reading Pound, Joyce, Stein, and Zukofsky. Berkeley, CA: University of California Press, 1994. The Museum of Modern Art, New York, Four Americans in Paris: The Collections of Gertrude Stein and Her Family. New York: The Museum of Modern Art, 1970. ISBN 078100674. Renate Stendhal, ed., Gertrude Stein In Words and Pictures: A Photobiography. Chapel Hill: Algonquin Books of Chapel Hill, 1989. ISBN 0945575998; ISBN 978-0945575993. "Stem's Way". Time Magazine. 1933-09-11. http://www.time.com/time/magazine/article/0,9171,746058-1,00.html. Retrieved 2008-08-14. Infography about Gertrude Stein Selective online and print resources recommended by a professor who specializes in research about Gertrude Stein. The Making of Americans, an opera by Anthony Gatto based on the novel by Gertrude Stein. Listen to excerpts of the premiere performance at the Walker Art Center in Minneapolis. UbuWeb: Gertrude Stein featuring a reading of If I Told Him: A Completed Portrait of Picasso and A Valentine to Sherwood Anderson. Gertrude Stein, Gradually Readings from Autobiography of Alice B. Toklas, Bee Time Vine, and more. Includes excerpts from Patriarchal Poetry. ^ During most of her life, Gertrude lived on a trust income from funds her brother Michael very capably stewarded and invested. After their parents died, Michael handled the affairs of his four younger siblings, Gertrude the youngest, still in her teens. 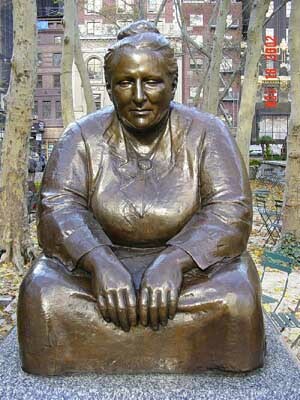 ^ "Has Gertrude Stein a Secret?" Cumulative Record, 3rd ed. New York: Appleton-Century-Crofts, 1972, 359-69. ^ Meyer, Steven. Irresistible Dictation: Gertrude Stein and the Correlations of Writing and Science. Stanford: Stanford UP, 2001. ^ Gauguin's Sunflowers is visible online at The Hermitage Museum's web site. ^ The particular Cézanne's Bathers is in the Cone Collection, Baltimore holdings. ^ (MoMA, 1970, p.26) The Delacroix painting is now in the Cone Collection, Baltimore. (Dorothy Kosinski et al., Matisse: Painter as Sculptor, p. 38 (Yale Univ. Press 2007). ^ Museum of Modern Art, 1970, pp. 88-89 provides detailed black and white images of the paintings on the wall. ^ The first, the Paris Autumn Salon of 1905, introduced Fauvism to the Paris art public, to some shock and political cartooning. The second, the Armory Show of 1913, held in New York City, introduced Modern Art to the United States art public, accompanied by similar public disparagement. ^ The Steins holdings were eventually dispersed, by various methods and for various reasons, and over time.The Family Knew What It Liked. ^ (Mellow, 1974, at 207-08). An image of "the Cézanne apples" appears in MoMA, 1970, Plate 19. ^ MoMA, 1970; The Collectors (about the Claribel and Etta Cone collection, with much on the Steins). ^ Alice's March 1967 obituary in the New York Times outlines some aspects of her relationship with Gertrude. ^ Someone Says Yes to It: Gertrude Stein, Alice B. Toklas, and "The Making of the Americans"; Janet Malcolm; The New Yorker, June 13 & 20, 2005; p.148-165 see p.164 for another description that Toklas gave of Stein's last words: "What is the question and before I could speak she went on--If there is no question then there is no answer". ^ Gertrude Stein and Alice B. Toklas Papers. Beinecke Rare Book and Manuscript Library at Yale University. Retrieved on 2009-07-08. They were gay every day, they were regular, they were gay, they were gay the same length of time every day, they were gay, they were quite regularly gay. Identity is funny being yourself is funny as you are never yourself to yourself except as you remember yourself and then of course you do not believe yourself. A novel is what you dream in your night sleep. This book is in every way except actual authorship Alice Toklas's book; it reflects her mind, her language, her private view of Gertrude, also her unique narrative powers. Every story in it is told as Alice herself had always told it. ... Every story that ever came into the house eventually got told in Alice's way, and this was its definitive version. online version - Stein, "Reflection on the Atom Bomb"
Young Girl with Basket of Flowers (lower left). (27 Rue de Fleurus, circa 1907). (image of Auntie with Gertrude and Alice).